Before I start this review, let’s get something out of the way: I have not read “The Hunger Games” or any of the other books in the series. I cannot compare the film adaptation to the original book. Therefore, I will be reviewing “The Hunger Games” as a movie, not an adaptation. I will admit that I ignored “The Hunger Games” for most of its popularity because I associated it with the tweenage wasteland of “Twilight.” “The Hunger Games” does not deserve to be put into that category because the story is much more mature, the characters are more complex, and if the movie is any indication, Suzanne Collins is a much better writer than Stephanie Meyer is. The difference is that Collins seems to write about teenagers from the perspective of an adult, and Meyer with the prose of a fifth grader. Plot description is probably irrelevant for all fans of the novel, but hopefully people unfamiliar with the books will go see it, too. “The Hunger Games” takes place during an unknown time in the future in the nation of Panem, which was once the United States. After a rebellion (which hopefully will be explained in the next film), Panem has been divided into districts. Our main focus is in the rural District 12 which, like the rest of Panem, is in ruins. Each district seems to be closed off to protect the people from each other. Apparently in the future, people are no longer to be trusted. 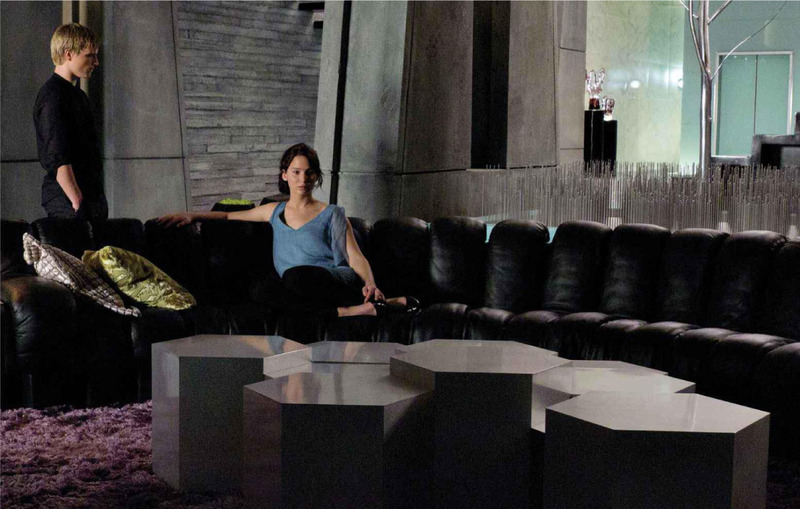 In District 12 lives Katniss Everdeen (Jennifer Lawrence), who for the rest of this review will be known as Catnip. Teenage Catnip cares for her younger sister Primrose (Willow Shields) and her mother (Paula Malcomson). Her mother is never given a name, but it seems like something we really should know. Catnip is young but mature beyond her years, assuming the role of both hunter and gatherer for her family. Her skill with a bow and arrow will come into play later on. On a related note, it’s kind of awesome when a dystopian movie uses primitive weapons. To punish the people for the rebellion, each year the government hosts The Hunger Games, in which a boy and girl from every district is chosen for an arena battle to the death. The names are chosen at random in a lottery-type system. Prim, eligible for the first time to compete, is chosen to represent District 12. Not wanting her younger sister to have to face death, Catnip offers herself up in Prim’s place. And with that, “The Hunger Games” shows that it is not one of those “Chosen One” narratives a la “Star Wars” and “The Matrix.” In this world, no one is that special. Catnip makes quite an impression on everyone with her brave sacrifice. Chosen alongside her is Peeta (Josh Hutcherson), who will be referred to as Pita for the remainder of this review. In his first interview before the Hunger Games begins, Pita declares his love for Catnip on national television. Awkward. This story, essentially, is about a world in which the most important thing is getting other people to like you. Catnip learns this during her publicity tour, but I liked her from the start. Lawrence plays her with the same brashness, wisdom, and self-assurance that originally made me notice her in “Winter’s Bone” in 2009. This character is not trying to break any female stereotypes, she just shows the kind of strength and bravery worth admiring in any human being. Think of her as a teenage version of Ripley from “Alien.” Like Ripley, she assumes a mother-like role for just about everyone she can. One of my biggest problems with many action movies is that they will let the hero win everything, but never give them much struggle. However, Catnip is one of those plausible heroes I have seen on screen in sometime. She has to overcome a lot in order to win. And while everyone else around her is an actor, she is a reactor. Everyone else is trying to simply hunt or be hunted, while Catnip uses the tools provided by the world around her in order to win. She is not only strong, but also smart. I will continue to follow this series, and even read the books, because of her. 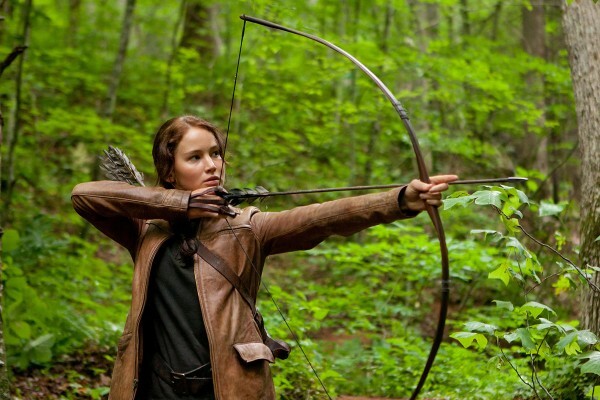 “The Hunger Games” is a well above average summer blockbuster playing in March. We all know the hero will survive until the end, yet there is still doubt and suspense every time Catnip is in peril. That is what good filmmaking is all about. Thank you for that, director Gary Ross, who also wrote “Big.” These two movies are not related in anyway, but I just felt the need to point this fact out. Ross brings this world to life. The outside is bleak and mechanical like any dystopia, yet everything inside is bright, colorful, and fast-paced. Caesar Flickerman (Stanley Tucci), who acts like the Jeopardy host from “Slumdog Millionaire,” looks like he blue himself. Bringing a popular novel from page to screen is never easy, and some things are certainly lost in translation. Even as someone who has never read the book, I could tell that much had to be taken out. So much of the movie is setup, yet much more could have been done to introduce the world. I would like to know more about the other districts, as well as District 12. An adaptation should be inviting of new followers, and not exclusive to those familiar with the original. Apparently in the novel, Catnip was gaunt and starving. Lawrence is a great choice for Catnip, but she does not appear as either. Also, the Hunger Games at times seemed rigged, and it would have been really interesting to delve more into the people who were orchestrating the games. Everyone else fighting besides Catnip had absolutely no personality. Maybe it will be revealed in the next chapter, but who exactly is the villain of the Hunger Games. But now, let’s get back to Pita. In order to make a love story engaging and emotional, both lovers should be equally interesting. To be honest, Pita might as well have not been there. Nothing about his skills, nor his backstory, are fully elaborated. In the end, it is possible that the two are not even in love, as Catnip has another love interest at home. I smell a love triangle! See the image in full here. But I digress (briefly). “The Hunger Games” seems to be leading to the point that their is a difference between relationships and personalities formed by the public, and those that are actually real. However, it would have made more sense had their love not seemed so force. I am not calling this deliberate, this is definitely a flaw. However, I hate to slip into such negative territory with this movie. Here, I believe the positives overpower the negatives. The second the games begin, we are immediately drawn in the scary and unpredictable idea of death at any moment. I can’t remember the last time I went to a movie and heard such a mixed emotional response from the audience. At some points, there was genuine laughter, and at other points, sniffling. I am not sure if this movie provided everything about the “Hunger Games” universe that it was supposed to, but I can’t wait for the installment to find out more. 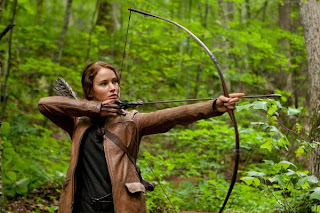 This entry was posted in Adaptations, Jennifer Lawrence, Josh Hutcherson, Movie Review, Stanley Tucci, Suzanne Collins, The Hunger Games on March 24, 2012 by ian0592.